Decisions about how to properly manage student loans are becoming more and more complicated each year with ICR, IBR, PAYE, RePAYE, PSLF, and other repayment programs. In addition, there are now more than 20 companies refinancing student loans, some of which will do so during residency. Making your student loan decisions properly can be worth tens or even hundreds of thousands of dollars. Unfortunately, many financial advisors don’t know the details of these rapidly changing programs. 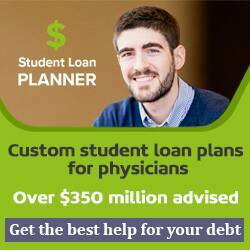 The advisors on this page specialize in student loan management. Like other recommended services, they are paid advertisers on the site who have been vetted by me. Travis Hornsby, CFA, founded Student Loan Planner in 2016 after discovering that bad student loan advice had cost his urogynecologist wife tens of thousands of dollars. Travis and his team have advised over $350 million of student debt, making Student Loan Planner the largest student loan consulting group in the country. Whether you’re trying to figure out how to get the most out of PSLF after a large increase in income, decide on your tax filing status as a married couple to minimize payments, or model the tax liability of seeking loan forgiveness in a non-PSLF eligible job, we’ve got you covered. The more complex your situation, the more we can help because we’ve probably seen it before with our more than 1,300 clients. Our singular focus on student loan planning (it’s not a lead generation tool for something else, it’s all we do) means our number 1 priority is removing your stress by getting the absolute best long term strategy in place. If you use the link on this page to book, we’ll give you an additional 6 months of email follow up questions after the consult for being a White Coat Investor reader. Jan Miller is a nationally-renowned student loan expert, and president/founder of his own private consulting company, Miller Student Loan Consulting, LLC. After working for many years in both the student loan industry, and the financial services industry, Jan now helps student loan borrowers nationwide with consolidating their federal loans, refinancing their private loans, enrolling in ICR, IBR,PAYE, RePAYE and other income-driven repayment plans, discovering student loan forgiveness options, lowering, delaying and/or simplifying their student loan payments, saving thousands in interest, and creating a financial plan for their student loan repayment that fits in with their budget and life. Jan offers complimentary consultations by appointment only. Scheduling one is easy at www.student-loan-consultant.com. Joy Sorensen Navarre, president of Navigate, is a nationally recognized expert on student loan forgiveness. Since 2009, Joy has helped physicians save nearly $30 million on student loan debt. When physicians get smart about loan relief programs and implement correctly, they reduce a major source of stress and save thousands of dollars. Physicians who consult with Navigate receive an analysis of student loans, estimates of monthly payments and future savings, comparison of multiple plan options, step-by-step instructions for implementation to avoid common mistakes and unlimited future follow-up at no additional charge. Most frequently requested services: 1) comparison of multiple employment offers and 2) review of current repayment plans to identify and remedy gaps. Joy offers both individualized physician consultations as well as informational presentations for residency programs, medical associations and hospital employers. WCI readers will receive a 25% discount on regular rates. Schedule an appointment for either service and get started today. Or call Joy at 612-470-2533. Joshua lives and works in Tampa, FL but works virtually with clients throughout the USA.